If you don't limit me by telling me what is possible, then I'll be far more interested in the journey that I have been sent on. 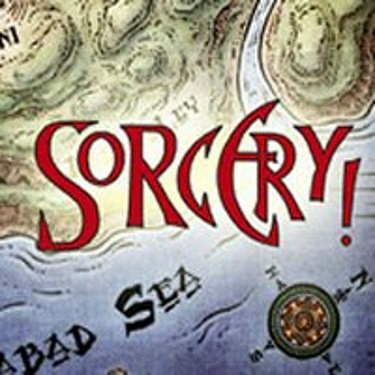 I've been waiting over a year to continue the journey across the wilderness of Steve Jackson's Sorcery! series. Based on the '80s Choose Your Own Adventure-style roleplaying book series of the same name, the digital version goes beyond what could be contained on the page. At this point, the books are mere outlines for the games. Each one continues to push further and further away from merely adapting from Sorcery's more static roots by continuing to add and by diversifying the series's content a considerable amount. The Sorcery! games are structured as a linear series of isolated encounters with each episode focusing on the main goal of getting to the other side of the map. Meanwhile the overall mission across the four entries of the series is to retrieve the stolen Crown of Kings. So far the games have only lightly touched on the main quest, instead focusing on the cavalcade of local problems that the player encounters. The third game, The Seven Serpents, picks up where the last one left off, leaving the city of Khare in whatever state that you left it in and continuing on through the lost wastelands beyond. These lands are more primal and far emptier than any seen thus far. You are warned that seven servant serpents of the Archmage have been dispatched and are on their way to warn their master about you and to hinder your progress. As was the case before, your goal remains to make it to the other side of the map, but now there are additional sub goals required of the player (to dispatch as many of the Seven Serpents as possible), which is not as easy to accomplish as they might sound. In combat, each serpent is as tough as the final boss monsters in the previous games. You can take them on man vs. snake, but it is easier and wiser to ask the scattered inhabitants for information about them and to listen to the winds for clues about their weaknesses. It seems inkle has been flexing their interactive fiction muscles, as each entry in the series expands the nature of journey. In the Shamutanti Hills, the journey was interrupted by a bunch of forks in the road that eventually all merged back together at the other end of the map. In Khare, City of Traps, the nature of the game's structure was altered to resemble something like forward moving spirals. In that episode, you can move forward, never looking back, or you can opt to take one of a number of alleys, side streets, and underground passages that ended up looping around sections of the city and then back on themselves, allowing you to search more of the city with each pass. The Seven Serpents is about as open world as a purely text-based game can be. All the points of interest aren't paths pushing you forward so much as they are nodes connected by a web of paths in a wide landscape. There are mountain ranges and rivers that section off parts of the map from one another, but within those sections, you can head in any direction that you wish from any node that you wish. From a programming and design standpoint, it doesn't sound all that difficult or novel. Text adventures have been doing the room based structure since their inception with the Colossal Cave Adventure of the 1970s. But Sorcery! 3 is not content to rest on the static nature of such a structure and call that an open world. Instead, inkle makes the setting dynamic. Time passes. Morning turns to day, which turns to evening, which turns to night. What you see and encounter at any given node can change depending on the time of day that you arrive there. You also had best watch your food supply or risk losing much needed health. Encounters also change depending on the information that you have or what you've done elsewhere. In one section early in the game, I came across a cloaked figure that bumped into me and disappeared into the mists. I found that I was missing a needed magical item to proceed with this encounter. I later found that magical item in a basement several leagues away in a different era next to a chained criminal. I could have missed both encounters easily, which makes me wonder how many such connected encounters I missed. I've taken advantage of the rewind function in the game to backtrack through my journey and try a different order to things and have noticed some of the changes, but surely not all. I mentioned a different era. The world is further complicated depending on what era a given node is in, whether that be an event taking place in the present or one shrouded in the mists of the past. You control your place in time by using a number of beacons, basically magical lighthouses, that can turn part of the wasteland into the vibrant land that it was before the Archmage's destructive rule, a rule that began 1,000 years ago. The exploration possibilities in the game, then, are enormous. The supremely dense world of Sorcery! 3 sparks the imagination because there is something unknown behind every tree and over every hill. When an item is found, it is presented through a textual description and the odd black-and-white ink sketch. It's not possible to find everything in a single run through the game, probably not even after playing multiple times, and I think that this is to Sorcery! 3's benefit. As much as I want to know and seek out everything, there is a blessing in the grand fuzziness left at the edge of the map, that promise of something else out there. It's that feature that has kept me interested in this series. For as basic as the plot is (There is a wizard. Go and kill it. Retrieve magical MacGuffin.) and as rote as the world is (generic Tolkien inspired fantasy world), I still want to travel through this one. There are many other games with such basic interchangeable elements, and the world of Sorcery! could belong to any of their fictions. What it offers that is new exists in how differently it presents the same basic material. It's not offering a landscape, but a jumpstart to the imagination that seems so lost in our current era, an era in which everything must be meticulously detailed, wikied, and then explained. The mystery of many games is lost in such a climate, not the mystery of what happened or who did what, but the mystery of life, of existence, of what is possible. If you don't limit me by telling me what is possible, then I'll be far more interested in the journey that I have been sent on.